IT IS A long way down from Mount Olympus. Last year Emmanuel Macron strode into power with a mandate to reform France. This week France looked unreformable. The streets of Paris have been littered with burned-out cars and glass from smashed shop windows. Parts of the countryside are paralysed, as protesters in high-visibility yellow jackets obstruct roads and blockade fuel depots. Policy U-turns are making Mr Macron look as weak as all his recent predecessors who tried to change this most stubborn of nations. The man who once promised a “Jupiterian” presidency is looking decidedly mortal. Mr Macron’s election in May 2017 seemed to herald new optimism about France, Europe and the world. Young, intelligent and bubbling with ideas to make France more open, dynamic and fiscally sober, he gave an eloquent rebuttal to the drawbridge-up nostalgia of Brexit Britain, Donald Trump’s America and the autocracies of eastern Europe. The hope for a broad renewal of the radical centre came to rest on his shoulders. When this new party, a band of political newcomers powered by social media, won a thumping parliamentary majority, the Macron revolution seemed unstoppable. He swiftly passed long-needed reforms to make the labour market more flexible, working with moderate unions and facing down obstreperous ones. His education reforms offered smaller classes in poor areas and greater citizens’ control over training. The budget was knocked into shape, meeting the Maastricht deficit limit of 3% of GDP for the first time since 2007. Yet along the way, Mr Macron forgot that a French president is neither a god nor a monarch but merely a politician in a democracy that requires the constant forging of consent. His hauteur has led to a series of individually small but cumulatively destructive missteps—scolding a teenager for calling him “Manu” instead of “Monsieur le Président”, summoning parliament to be lectured at the palace of Versailles, talking of “people who are nothing”. Mr Macron also seems to have forgotten that, in the first round of last year’s election, 48% of voters were so unhappy that they backed extremists: Marine Le Pen on the nationalist right, Jean-Luc Mélenchon on the left and half-a-dozen less charismatic radicals. Those voters have not gone away. So it was unwise of the new president to antagonise the left-behind carelessly. One of his first moves was to slash taxes on wealth. The old wealth tax was inefficient, incentive-sapping and often avoided. But its removal should have gone side-by-side with more help for the hard-up. Likewise, his tax rises on diesel are a sound green policy, but he should have paid more attention to the people they hurt most—struggling rural folk who need to drive to work. The most damaging label that has stuck to the former banker is that he is “the president of the rich”. Many French people believe this, which is perhaps why around 75% say they support the gilets jaunes protesters. Like Mr Macron’s election campaign, the protesters are organised via social media. Unlike it, they are leaderless and lack a coherent agenda, so they are almost impossible to negotiate with. The clashes already look to be the worst since les évènements of 1968. Mr Macron will now be banking that his decision, on December 5th, to cancel the diesel tax rises “for the year of 2019”, will take the heat out of the conflict. This seems unlikely; for a start, the protests have in part now been hijacked by thuggish extremists with an interest in the violent overthrow of capitalism. 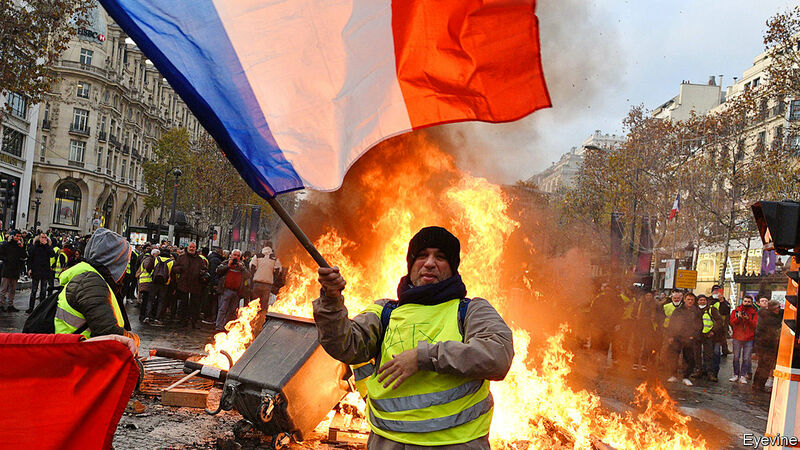 Many of even the moderate gilets jaunes are demanding Mr Macron’s resignation, or a new parliament. And an earlier diesel tax rise which went into effect last January, has not (yet) been reversed. The government’s reaction could backfire horribly. It may not be enough to draw the sting from the protests. But, by giving ground at all, it may show that Mr Macron can be pushed around by mobs on the streets, thus encouraging more mobs to form. 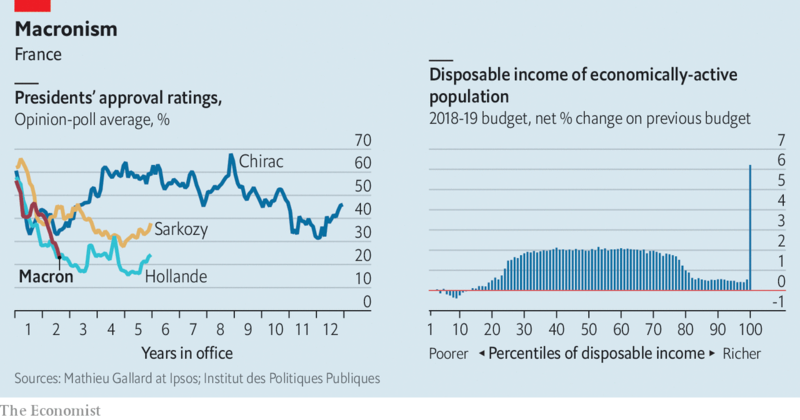 There is pressure on Mr Macron to bring back the wealth tax; and further reform now looks much less likely than it did. Yet there is plenty of hard work still to do; the next overdue project that Mr Macron plans to tackle is France’s unaffordable pension system. Does all this mean that have-your-cake-and-eat-it populism must triumph, and that reformers will always be thwarted? It is depressingly easy to conclude so. Mr Trump has won the support of his base by offering Americans tax cuts that are not affordable in the long term. In Italy the all-populist ruling coalition promises to lower the pension age that a more prudent predecessor raised, while also offering deep tax cuts. Even Vladimir Putin did not have the courage to face down Russian pensioners this year. All is not lost for Mr Macron. He could help himself in several ways. First, he should demonstrate where his priorities lie. It will be expensive, but some form of earned-income tax credit is needed: a proper wage subsidy for the low-paid that enhances their incentive to work, rather than draw the dole. (One exists already, but it is too small. Mr Macron has promised to beef it up, but only slowly.) That should have gone hand in hand with scrapping the wealth tax. Second, he and his government need to do more to promote and explain the good things they have already done but which are underappreciated—such as the investment in apprenticeships, or the moves that will make it more likely that businesses will hire young people on long-term contracts. The unemployment rate is down by half a percentage point, though still much too high at 9.1%. And third, Mr Macron himself needs to change. His notion that the French want their president to be aloof and Jupiterian is misguided. As our chart shows, the most popular French president of recent times was the least remote—Jacques Chirac, a beer-swilling, heavy-smoking mec with a twinkle in his eye. In an age where populists will do and say anything, a politician who cannot persuade ordinary people that he or she understands them, likes them and wants to help them will struggle to get anything done. 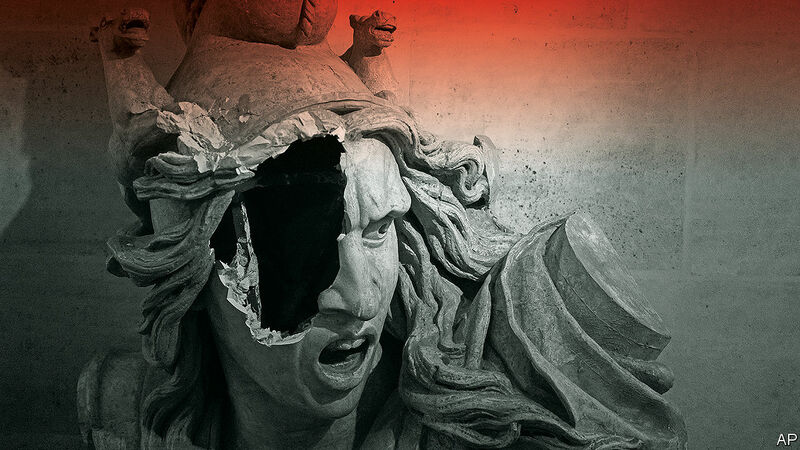 It will not take superhuman powers to reform France—just the very human ones of patience, persuasion and humility. Danish physicist and Nobel laureate Niels Bohr famously quipped that “prediction is very difficult, especially if it’s about the future”. But as 2018 enters its final stretch, Wall Street’s analysts are once again dusting off their crystal balls and attempting to map out what the coming year will look like. An always tricky task is now nearly impossible. Economists and analysts are actually reasonably good at getting the general direction correct, but awful at anticipating turning points. And as 2018 showed — with virtually every major asset class heading for a loss — markets appear to be entering a new, more uncertain phase. Is 2019 the year when the post-crisis bull run falls completely apart? “All good things eventually come to an end. But when? Answering this question represents the fundamental 2019 investment challenge for portfolio managers,” David Kostin, chief US equity strategist at Goldman Sachs, wrote in his annual outlook. 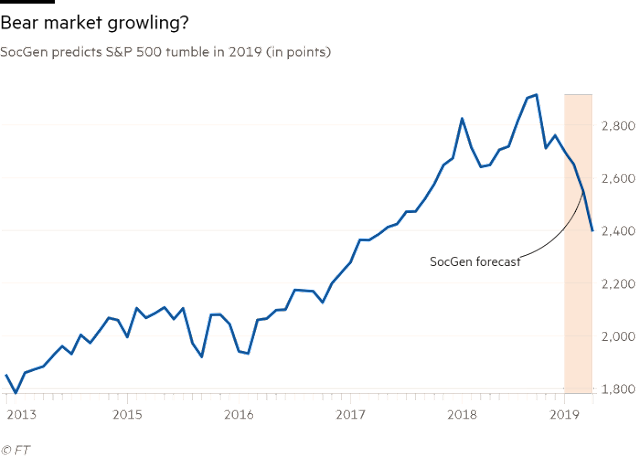 Big picture: the median forecast of strategists polled by Bloomberg indicates the US economy will grow 2.6 per cent in 2019, while the S&P 500 will end the year at 3,090 points, with the 10-year Treasury yield at 3.44 per cent. Pretty much everyone expects the dollar to weaken next year, as the Fed interest rate cycle peaks. But diving into the details of the outlook reports, there are some more interesting predictions. Here are some of them. Most analysts, even bearish ones such as Morgan Stanley’s Mike Wilson, think the S&P 500 will end 2019 higher than its current level. But Société Générale’s 2,400-point end-2019 prediction — and for a recession by the first half of 2020 — stands out as the most negative one by far. 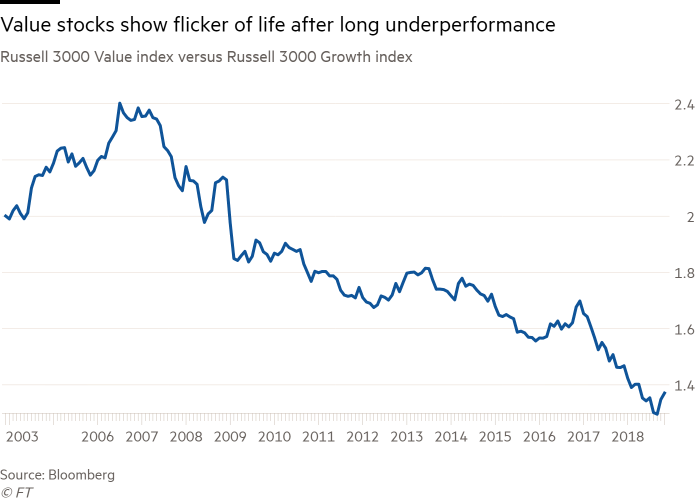 It implies another 10 per cent drop from the current level, which would mean a bear market for US equities (typically defined as a 20 per cent drop from the recent high). “We expect a more restrictive monetary policy to push equity valuations lower, while political gridlock and trade tensions will likely be a source of volatility,” SocGen said in its outlook, fittingly illustrated by a waving grizzly bear. But SocGen is also gloomy on European equities — eyeing another 8 per cent drop to take the Euro Stoxx 50 into a bear market — thinks Japanese equities will tread water and forecasts that the FTSE 100 will tumble by another 14 per cent. 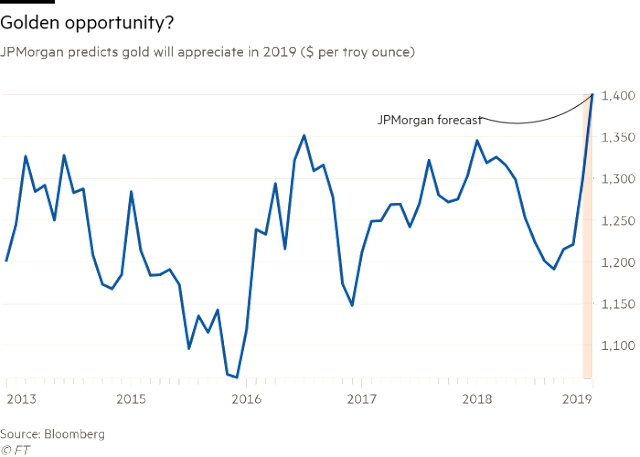 Gold bugs have had a frustrating year, as a splurge of Treasury issuance has failed to shake faith in the greenback, and a the strong economy and the Fed’s rate increases have sucked in money from abroad. This has led gold to shed almost 5 per cent of its dollar value in 2018 to trade at about $1,240 per troy ounce. But both JPMorgan and Bank of America reckon a renaissance is coming, as the US central bank slows its rate increases and financing the US deficit becomes more challenging. 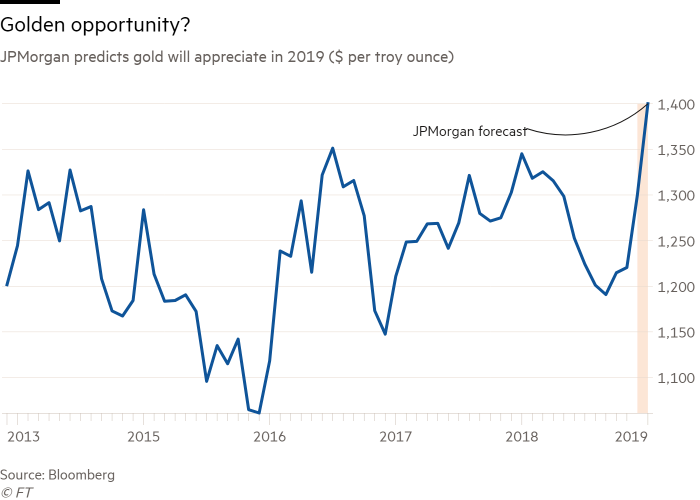 BofA sees gold appreciating a modest 5 per cent, but JPMorgan predicts a juicier 15 per cent return, “as US real rates peak and focus turns to financing the US’s twin deficits when the Fed cycle is near an end”. Most analysts expect US inflation to stay subdued in 2019. The core “personal consumption expenditures” price index — the Fed’s preferred inflation measure — is expected to tick up from 1.9 per cent to 2.1 per cent next year, but some strategists fret that this is complacent. Macquarie expects core PCE to accelerate a touch faster, to 2.2 per cent in 2019, and warns that even this may be too low an estimate, given the danger of tariff costs being passed on to consumers, a weaker dollar, rising natural gas prices, spendthrift fiscal policy and the labour market reaching a “pinch point” that causes wages to shoot higher. Given how sensitive financial markets have proven to any hint of accelerating inflation this year, this could be the still-unlikely but most dangerous risk to watch in 2019. 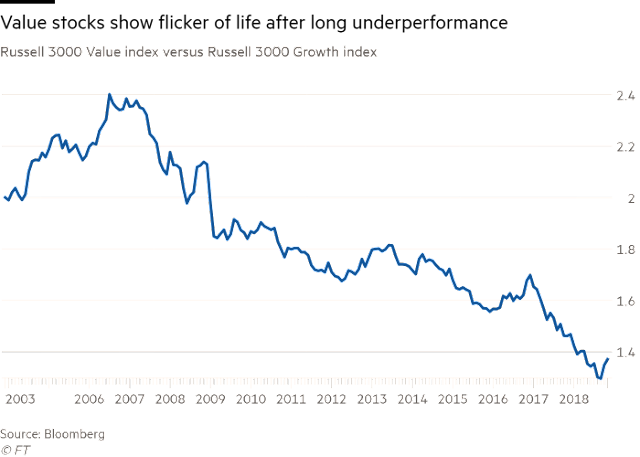 Cheap, stolid “value” stocks have been left in the dust by racier “growth” stocks since the financial crisis, but Morgan Stanley reckons that 2019 will see “a major leadership change occurring from growth to value which could be more long-lasting than most appreciate”, pointing to their relatively low prices and how growth stocks are more sensitive to higher bond yields. The alphabet soup of securitised bonds has done fairly well in 2018, especially products such as collateralised loan obligations and floating-rate asset-backed securities, which benefit from rising Fed interest rates. However, BofA reckons that the poor performance of “agency” mortgage-backed securities created by Fannie Mae or Freddie Mac — which have faced headwinds from the Fed shedding MBS from its balance sheet — could be a “harbinger of what’s to come in other securitised sectors in 2019”. 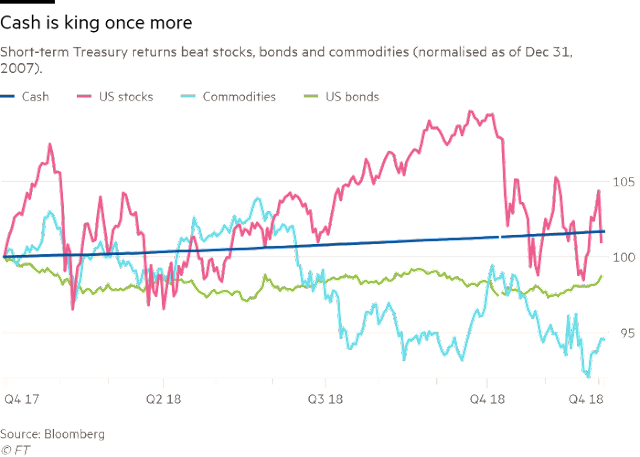 Cash has been one of 2018’s surprise performers, with the returns from Treasury bills beating broad bonds and equity and commodity indices — an exceptionally unusual occurrence. Many investors point out that this happening two years in a row is almost unheard of, but JPMorgan warns that they should gird themselves for disappointment once again. JPMorgan’s chief cross-asset strategist John Normand sees returns of plus or minus 1 per cent for most asset classes, but thinks rising US interest rates will mean that cash will return 2.8 per cent in 2019. Goldman Sachs predicts cash returns will hit 3 per cent. Rate increases from all developed country central banks will also lift global cash returns from zero in 2018 to 1 per cent next year, JPMorgan forecasts. However, that will weigh heavily on developed market bonds, and inflict another 2.4 per cent loss on investors. That would be the first consecutive yearly loss for bonds since modern bond benchmarks began in the early 1970s. Smaller US company stocks have been pummelled lately, tumbling more than 15 per cent since their summer high to underperform the “large-cap” S&P 500, despite being in theory more immune to any deepening trade wars. Deutsche Bank’s chief US strategist Binky Chadha reckons this is way overdone, pointing out that small-caps are now pricing in a sharp US economic slowdown and are unusually cheap compared with large-caps. Given the relative positioning — traders are now net short the Russell 2000 small-caps index but long the S&P 500 — he recommends investors look for opportunities there instead. Just over a month from now, on Jan. 10, Nicolas Maduro is scheduled to be sworn in again as president of Venezuela. The occasion won’t be without controversy – some 50 countries failed to recognize the elections in May that set Maduro up for another term in office – raising familiar questions about his government’s staying power. For the past year, Maduro’s administration has appeared to be hanging on by a thread, and Venezuela’s various crises show no sign of abating. It is, by now, an all too familiar story, that of the country’s seemingly inexorable slide deeper and deeper into chaos. Low oil prices are the scapegoat most commonly assigned to the country’s recent decline. The narrative explains how the economy can now be on the brink of collapse after flourishing for years under high oil prices, but it fails to account for all of Venezuela’s problems. The price of oil does little to explain, for example, the degradation of the country’s institutions, the tenacity of its despotic leadership or the lack of a united opposition despite the public’s resounding rejection of the government. To understand these phenomena, one must first understand the structural design that has been in place since the earliest days of modern Venezuela’s existence. The centralized power, military presence, weak institutions and economic overreliance on commodities that characterize current government are not unique to it. Rather, they are rooted in Venezuela’s colonial past and early years of independence. This Deep Dive examines the interplay between these factors that has dictated the behaviors and actions of governments past and present. Venezuela’s precedent for totalitarian rule long predates Maduro or his predecessor, Hugo Chavez. In fact, in its nearly two centuries of existence, Venezuela has functioned as a modern, Western-style democracy for only 40 years, from 1959-1999. (Though Chavez won power in democratic elections in 1998, his presidency brought a decisive end to the period of democracy.) More often, the country has operated under a strong central government led by a single individual empowered through a patronage network, an idea that traces back to the caudillo system in the colonial period. Caudillos were affluent men who owned or oversaw production on land and rejected Spanish rule. Because they were too few in number to fight on their own, they used their elite social status to enlist the help of the lower classes, whom they organized and led as militias against Spanish troops. The tradition continued even after Venezuela won its war for independence. Without their Spanish overlords or a reliable national government to provide security, local landowners established patronage systems and local fighting forces, which they used to seize control of assets, such as customs houses, and territory. The most successful caudillos became generals in their militias and could project power beyond their region to compete on a national level. The caudillo system reinforced the need for a strong centralized government in Venezuela and gave rise to the dozen or so revolutions in the country’s history. The constant jostling for ascendancy made the caudillos in power, and those aspiring to it, vulnerable to attack. At the same time, the system’s emphasis on regionalism made it difficult for leaders in one area to secure buy-in elsewhere in the country. Maintaining power required a firm hand. Still, schisms and shifts in allegiance were common, and when an opposition group wanted to challenge the government for power, a revolution broke out. Strongmen rulers rose and fell in this way, for much of the country’s history. (A push for decentralized power among the caudillos led to civil war in the mid-19th century, followed by a brief period of federalism in the 1860s.) Even Venezuela’s first attempts at democracy began with an uprising, known as the October Revolution of 1945. Chavez’s Bolivarian Revolution in 1999 built on this tradition – and today Maduro draws on that legacy through his rhetoric and invocations of the now-idolized late president. With this kind of turnover in the government, Venezuela has struggled to build firm and enduring institutions. Many dictators have managed it during their tenures, but usually by exerting strong influence over government institutions, which, as a result, were not accountable to the public. Furthermore, these institutions typically have lasted only as long as the government that put them in place. It became the norm in Venezuela that a revolution or major political transition would usher in a new constitution engineered by the new administration to suit its aims. Since independence, the country has had 27 different constitutions, the most recent of which came about in 1999, under Chavez. What institutions have emerged in Venezuela have rarely had a chance to take root, much less flourish. Part of the challenge is the patronage system that has underpinned nearly all of Venezuela’s rulers, from the caudillos to Maduro. Throughout Venezuela’s history, leaders have incentivized loyalty among their constituents and officials by offering them various rewards. The practice has made corruption a rampant problem in the country. It has also made organizing political movements around issues difficult, since people are accustomed to looking not for the candidates who best represent their beliefs or concerns but for those who can give them the best deals. In the latter half of the 20th century, those deals centered on agrarian reform, public works in poor urban neighborhoods and military funding. Maduro has adapted to Venezuela’s current economic difficulties by offering followers preferential access to food and U.S. dollars and by allowing pro-government armed groups to operate in the country. The trouble, of course, is that if government revenue drops off and the country’s leaders don’t have enough money to subsidize their supporters, their fortunes can quickly turn. And in Venezuela, government income depends largely on commodities prices – its economy has centered on commodities exports from the very start. Colonies like Venezuela served two purposes for the Spanish crown: to provide raw materials to feed nascent industry back home and to buy up Spain’s finished goods. To ensure that its needs were served, Spain restricted colonial trade, first limiting the colonies to trade with only Spain and then permitting them to trade with one another as well. So it was that coffee, cacao, sugar, tobacco and leather became the mainstays of Venezuela’s economy. The pattern continued even after Venezuela won its independence, only with new trade partners. The United Kingdom and other European powers, eager to hasten the Spanish Empire’s decline, had funded Venezuela’s efforts against Spain, offered it flexible financing to promote economic recovery in the conflict’s aftermath, and opened trade with Venezuela. But the basis of their trade was the same exchange of raw materials for finished goods that Venezuela had had with Spain. In addition, the foreign financial assistance put Venezuela into debt, which continued to grow because of servicing costs and rollovers, along with the country’s attempts to modernize its agricultural sector. When commodity prices dropped – particularly for coffee as Brazil increased production – they set off Venezuela’s first major debt crisis in 1903. The discovery of oil reserves in the country a decade or so later alleviated its debt problem and gave Caracas a robust new source of revenue. In other words, the government found a new commodity to hitch the economy to. Commodity price fluctuations have plagued Venezuela ever since, causing recurring debt crises. When oil prices are low, the government borrows to cover its costs; then in more prosperous times, it devotes much of its revenue to paying down its debts and fortifying its pillars of support. (During an oil boom in the 1970s, for example, Caracas focused its public spending on educational programs related to the oil industry.) This leaves the government with little money to invest in developing other areas of the economy, thereby perpetuating the cycle. The combination of low commodity prices and mounting debt has been the downfall of numerous administrations over the years. Commodity dependence makes any government vulnerable to market forces beyond its control. But that goes double for the Venezuelan government, since it derives much of its legitimacy from the patronage system. A crash in coffee prices in the 1830s and 1840s brought down the administration of President Jose Antonio Paez, a hero of Venezuela’s war for independence. A similar fate befell President Rafael Caldera in the 1990s, when lower oil prices and higher debt levels sapped the popular support that had won him a second term in office, paving the way for Chavez’s rise to power. And today, Maduro – who assumed the presidency in 2013, just a year before global oil prices tanked – finds himself in the same position. Languishing oil prices, coupled with high debt, will eventually be his undoing. In the meantime, Maduro is drawing on his ties with the military to maintain his grip on power – a time-honored tradition among Venezuela’s leaders. The bond between the country’s government and military, like its commodity dependency, also goes back to colonial times. Having conquered local forces and rival powers for control of Venezuela, Spain crafted a military-centric administrative structure for the territory to defend it and its resources against the many foreign competitors in the surrounding area. High-ranking generals took control of the territory in 1777, when Venezuela gained autonomy as a captaincy, and, after independence, the military continued to play a prominent role in the country. Most caudillos had at one time been commanding officers in the armed forces. Since then, plenty of leaders have turned to the military to help keep or restore order. Gen. Juan Vicente Gomez Chacon, for instance, depended on security forces to suppress the roughly 20 armed domestic rebellions he faced while in power. President Romulo Betancourt, likewise, had to rely on the military to repel attacks from leftist guerrilla groups even during Venezuela’s democratic phase. And Chavez came to power after a career in the military. Though Maduro never served in the military, he has aligned himself with it and stayed close to it. He selected Vladimir Padrino Lopez, an officer loyal to Chavez, as his defense minister on taking office and has made sure to share the spoils of power with the security forces to ensure its support for his government. Over the course of his administration, Maduro has extended the military’s reach by giving it prominent roles in areas such as the energy sector and food distribution programs. He also has turned a blind eye to its illicit activities, including drug trafficking. In return, Maduro has used the military’s intelligence branch to imprison opposition leaders and suspected dissidents among the security forces. If the president’s favor hasn’t been enough to eliminate dissent in the armed forces, it has at least kept the military largely invested in the Maduro administration’s survival. Even so, the end of Maduro’s tenure is inevitable. Geopolitics tells us that, based on the forces and realities the president is up against, his days are numbered – at this point, even a sudden spike in oil prices wouldn’t necessarily save him. When and how his government meets its end is harder to say, but history may serve as a guide. Venezuela’s past is replete with examples of fallen governments and the many causes of their demise. Civilian-military coups have spurred government transitions on multiple occasions. Indeed, in 2017, brewing dissent in the security forces prompted the government to crack down on military personnel who broke rank. But Venezuela’s opposition is too divided to overthrow the government, despite its efforts to unify, thanks to infighting and institutional defeats. Each party in the opposition, like any other coalition, has its own views on the government’s ideal end state and is reluctant to subjugate them to those of another group. The daylight between conservative and liberal factions in the opposition has led to power vacuums and political chaos in the wake of even successful coups, such as the ouster of the Monagas brothers in 1858. The opposition in contemporary Venezuela, moreover, has struggled to wrest power from Maduro under better circumstances – like when it won a majority in the National Assembly in late 2015. (Parliament, after all, is only one of five branches of Venezuela’s government, and the rest are still firmly under the president’s control.) Having run itself ragged with public protests and fruitless dialogue with Maduro and his supporters, the opposition took a break over the past year to regroup. It’s expected to resume its protests in January, and if it pulls together, it may yet be able to push for a democratic transition. Otherwise, any number of contingencies could bring Maduro down. Someone could seize power while he’s out of the country, for example, though the president’s several recent trips abroad suggest he’s not sweating that possibility. Direct foreign intervention also seems unlikely. And while Colombia and the United States will continue to increase pressure on the Venezuelan government through sanctions, doing so probably won’t be enough to cause its collapse, unless they take direct aim at state oil company Petroleos de Venezuela. Instead, the eventual power transition in Caracas is liable to be a domestically driven affair. There is even the possibility that the current administration eventually comes around to orchestrate its exit and set the stage for a new government, as longtime Spanish dictator Francisco Franco did before his death and as the Brazilian military junta did before ceding power in 1986. When a new government does take over in Venezuela, it will have its work cut out. The next administration will need to rebuild from the ground up, a task that may prove an opportunity to break the patterns that have shaped Venezuela’s government for most of its history. That it spent four decades as a democracy – the result of various political factions uniting to overthrow an authoritarian government and to rule instead by coalition – suggests Venezuela is not predestined for dictatorship. Breaking old habits and establishing new ones isn’t easy, but neither is it impossible, as countries such as South Korea, which managed to industrialize its economy decades after major Western countries had done so, can attest. Institutions wax and wane over time. Even those that seemed infallible at one point in history, like the English monarchy or the Argentine military, invariably give way to others. These processes take time and effort, of course, and just as many countries fail at them as succeed. Nevertheless, these are the big pictures issues that will help determine Venezuela’s future. Is Fake News Here to Stay? Experience from European elections suggests that investigative journalism and alerting the public in advance can help inoculate voters against disinformation campaigns. But the battle with fake news is likely to remain a cat-and-mouse game between its purveyors and the companies whose platforms they exploit. CAMBRIDGE – The term “fake news” has become an epithet that US President Donald Trump attaches to any unfavorable story. But it is also an analytical term that describes deliberate disinformation presented in the form of a conventional news report. The problem is not completely novel. In 1925, Harper’s Magazine published an article about the dangers of “fake news.” But today two-thirds of American adults get some of their news from social media, which rest on a business model that lends itself to outside manipulation and where algorithms can easily be gamed for profit or malign purposes. Whether amateur, criminal, or governmental, many organizations – both domestic and foreign – are skilled at reverse engineering how tech platforms parse information. To give Russia credit, it was one of the first governments to understand how to weaponize social media and to use America’s own companies against it. Overwhelmed with the sheer volume of information available online, people find it difficult to know what to focus on. Attention, rather than information, becomes the scarce resource to capture. Big data and artificial intelligence allow micro-targeting of communication so that the information people receive is limited to a “filter bubble” of the like-minded. The “free” services offered by social media are based on a profit model in which users’ information and attention are actually the products, which are sold to advertisers. Algorithms are designed to learn what keeps users engaged so that they can be served more ads and produce more revenue. Emotions such as outrage stimulate engagement, and news that is outrageous but false has been shown to engage more viewers than accurate news. One study found that such falsehoods on Twitter were 70% more likely to be retweeted than accurate news. Likewise, a study of demonstrations in Germany earlier this year found that YouTube’s algorithm systematically directed users toward extremist content because that was where the “clicks” and revenue were greatest. Fact checking by conventional news media is often unable to keep up, and sometimes can even be counterproductive by drawing more attention to the falsehood. Such efforts include automated programs to find and remove fake accounts; featuring Facebook pages that spread disinformation less prominently than in the past; issuing a transparency report on the number of false accounts removed; verifying the nationality of those who place political advertisements; hiring 10,000 additional people to work on security; and improving coordination with law enforcement and other companies to address suspicious activity. But the problem is not solved. An arms race will continue between the social media companies and the states and non-state actors who invest in ways to exploit their systems. Technological solutions like artificial intelligence are not a silver bullet. Because it is often more sensational and outrageous, fake news travels farther and faster than real news. False information on Twitter is retweeted by many more people and far more rapidly than true information, and repeating it, even in a fact-checking context, may increase an individual’s likelihood of accepting it as true. 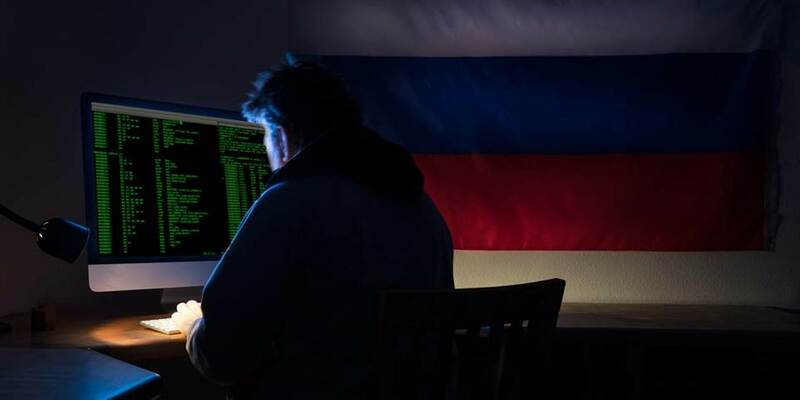 In preparing for the 2016 US presidential election, the Internet Research Agency in St. Petersburg, Russia, spent more than a year creating dozens of social media accounts masquerading as local American news outlets. Sometimes the reports favored a candidate, but often they were designed simply to give an impression of chaos and disgust with democracy, and to suppress voter turnout. When Congress passed the Communications Decency Act in 1996, then-infant social media companies were treated as neutral telecoms providers that enabled customers to interact with one other. But this model is clearly outdated. Under political pressure, the major companies have begun to police their networks more carefully and take down obvious fakes, including those propagated by botnets. But imposing limits on free speech, protected by the First Amendment of the US Constitution, raises difficult practical problems. While machines and non-US actors have no First Amendment rights (and private companies are not bound by the First Amendment in any case), abhorrent domestic groups and individuals do, and they can serve as intermediaries for foreign influencers. In any case, the damage done by foreign actors may be less than the damage we do to ourselves. The problem of fake news and foreign impersonation of real news sources is difficult to resolve because it involves trade-offs among our important values. The social media companies, wary of coming under attack for censorship, want to avoid regulation by legislators who criticize them for both sins of omission and commission. Experience from European elections suggests that investigative journalism and alerting the public in advance can help inoculate voters against disinformation campaigns. But the battle with fake news is likely to remain a cat-and-mouse game between its purveyors and the companies whose platforms they exploit. It will become part of the background noise of elections everywhere. Constant vigilance will be the price of protecting our democracies. Joseph S. Nye, Jr., is a professor at Harvard University and author of Is the American Century Over?